This is not the Golden Gate Bridge in San Francisco. This is not Christ the Redeemer in Rio de Janeiro. Both of these landmarks are in Lisbon, Portugal! The 25 de Abril Bridge was our first glimpse of Lisbon as we crossed it by car to enter the city, and we were all astounded at how identical in shape and color it was to the Golden Gate Bridge in San Francisco. The Cristo-Rei, or Christ the King, statue was inspired by the Christ the Redeemer statue in Rio de Janeiro and also watches over the city it protects with outstretched arms from an isolated hilltop. The week we spent in Lisbon last summer in a great little Baixa district apartment was a lovely end to our vacation - Lisbon is a magnificent city. Most impressive are the views, from almost everywhere throughout this hilly capital, of the Atlantic Ocean, the Tagus River, and red-tiled roofs as far as the eye can see. Because Lisbon was almost completely destroyed by an earthquake in 1755 and subsequently rebuilt by the Prime Minister at that time, a man with modern urban plans, the city today has large squares, grand boulevards, and many parks and plazas. Park at the Miradouro de São Pedro de Alcantara lookout point. Alfonso de Albuquerque Square in the Belém district. There are two UNESCO World Heritage Sites to visit in Lisbon: the Tower of Belém and the Jerónimos Monastery. The Tower of Belém was designed as a fortified defense tower and ceremonial gateway to Lisbon to ships traveling on the Tagus River. The Tower sits on the bank of the river and is open for tours, though we did not go inside. We did admire the architecture with its arched windows, balconies, and watchtowers. The Jerónimos Monastery was built in 1459 by Henry the Navigator to house monks and, with its cathedral, to be a house of prayer for seamen and explorers departing or entering port. Vasco da Gama and his crew spent the night in prayer at the monastery before leaving for the Orient in 1497. The monastery is an enormous, ornate structure and definitely worth visiting. Tour the cathedral and the stunning interior square cloister. Big tip of the day: entrance to the Jerónimos Monastery is free on Sundays! 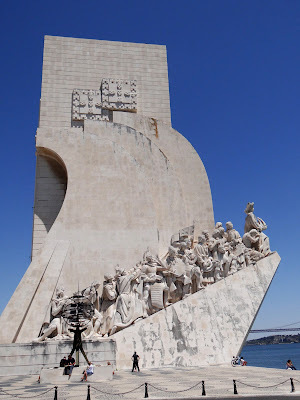 A short walk down the river from the Tower of Belém is another monument, the Monument to the Discoveries, a fairly recent (1960) structure to honor the Portuguese Age of Discovery of the 15th and 16th centuries. Its sculptured figures include depictions of Henry the Navigator, Vasco da Gama, Ferdinand Magellan and 30 other explorers. 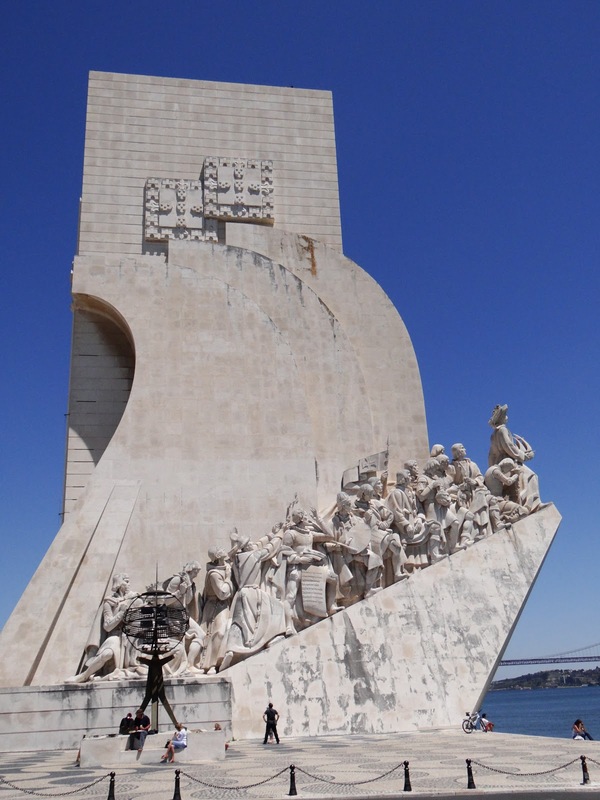 An elevator to the top of the monument takes you took a fine lookout over the city of Lisbon. Another tip for you: there are free, clean restrooms under the Monument to the Discoveries. It wouldn't be a great European city if it wasn't protected by a medieval castle on a hill, and Lisbon is proudly safeguarded by Castle of São Jorge, a 10th century Moorish citadel with a 360° view of the capital. A very lovely half day can be spent walking the castle walls, climbing the towers, and, as we did, enjoy a picnic inside the large interior square. Transportation around the city is unique and fun, and there are ways to save money. For example, to go across town by bus the fare is 1.75€ per person. For our family of four, a taxi cab was less than 7€ to travel almost anywhere in Lisbon so that was obviously cheaper and more convenient. Also, you'll definitely want to ride the iconic Santa Justa Elevator and one of the cute vintage cable cars. I suggest you do this on the same day to save money by buying a 5€ all-day transportation pass. This pass lets you ride all buses, subways, cable cars, and funiculars for 24 hours. A terrific savings, since the Santa Justa Elevator ticket by itself is 5€! Lisbon's subway system is clean and nice, but we found it not quite extensive enough to reach all the tourist sites. Vintage cable cars in Lisbon. Beautiful side trips, or day trips, to gorgeous towns such as Sintra, Cascais, and Estoril are an easy and inexpensive (18.40€ for the four of us to take the train to Sintra) train ride from the Lisbon station. Lisbon looks like such a lovely city and that bridge does look remarkably like the Golden Gate Bridge! The cable cars and the funicular look like such a fun way to get around the city - my younger daughter would love them! If you would have asked me to guess, I would have said the Golden Gate Bridge! I just stayed not too long ago in Fisherman's Wharf and saw that bridge and went over it nearly everyday while I was there! That is amazing! All of these photos are just remarkable of what must have been a very fun adventure. Hey Sonja! What a cool blog concept! I am now adding Lisbon to my list of places I'd like to visit! Absolutely beautiful. I'm following you back and looking forward to future posts! Beautiful blue sky and I love those cable cars! I have a friend that just moved to Lisbon. I am going to forward this to her. Hi! I'm a Europhile too but the only European country I've been to is England. Visiting the rest of Europe is on my someday list and I'm soooo glad we connected! Love your blog! The first time I dragged my husband to Europe, we landed in Lisbon. He was disoriented and couldn't believe we would be in Europe for the next two months. He didn't like it! But the next day, it seemed much more beautiful. :) We spent one of the best weeks of our trip in the Algarve, (Salema) where we rented a room in someone's house right on the beach for about 10 bucks a day. I still want to take our kids back there. I forget how beautiful Lisbon is, and how cheap Portugal is - or was, anyway, 15 years ago! Lisbon and Sintra have been on my trave list for awhile now. I have heard reference of how Lisbon and San Francisco are very much alike but never expected the Golden Gate replica. That's so interesting! Jerónimos Monastery is so beautiful! Lisbon sounds beautiful. My guys would love the cable cars and I'm so glad you included restroom tips. These are the hardest things to find when you travel!